You are currently browsing articles tagged Halloween. It’s not that I like pressure per se – it’s more like I’ve gotten pretty good at leveraging pressure into a source of active motivation. I’m a little hesitant to tell this story because 1) I can see my mom shaking her head and deeply sighing; and 2) it’s not my typical lifestyle! But I feel like it’s a common part of #college. On Sunday/Monday/Tuesday (it’s all a blur) I pulled my first academic all-nighter of junior fall. I had to specify “academic” because sometimes all nighters happen for fun i.e. tv series marathon, video games (Mario Kart, Tetris, Diner Dash! ), etc. I knew this day was coming because I had my Aesthetic & Interpretive Understanding: Literature & Medicine Midterm Paper due Tuesday at 1pm and my Math 18: Multivariable Calculus for Economics Tuesday at 6pm. I was mentally prepared, but perhaps I should have prepped physically by spending the previous days sleeping. One of the most memorable events of this Halloween season was my sighting of the most awesome boy dressed as Mario scurrying in the Yard. I’m sure he was late for another class/meeting or something, but I like to think he just was incredible at being in character at all times. I’m literally chuckling to myself as I’m recalling this. The scenario almost seems like it’s too good to be true but my friend witnessed it too! And we discussed how it’s kind of sad that more college kids don’t dress up in costumes for class like how we use to in high school/middle school/elementary. 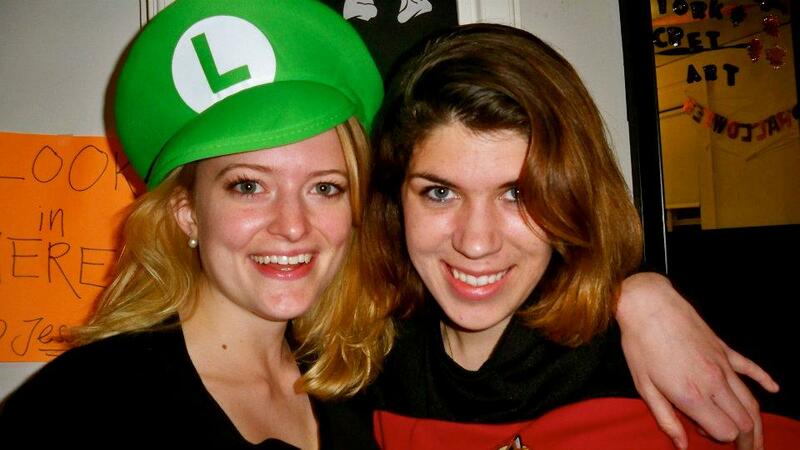 Celebrating Halloween is pretty necessary because its a general celebration of youth (and candy)! The fun Halloween spirit definitely kept my spirits uplifted even when I knew I had so much work to do for school. I trudged along in the library (multiple people were getting suspicious that I was living there) and worked calmly throughout the night. Classes were cancelled this past Monday due to Hurricane Sandy – and my thoughts and prayers definitely go out to all those affected! – and I used that day to continue working. What kept me going was my interesting paper topic. I think the first time I was ever genuinely interested in writing a paper was junior year of high school when I realized the complexity of my thesis excited me: gathering and analyzing evidence to support my claim (something along the lines of: murder is a kind of love / love inevitably leads to murder) was a challenge that I found thrilling. It was during this paper that I promised to myself that I would never write a paper with a thesis I didn’t like. I had met with my Literature & Medicine TF (teaching fellow) to discuss my thesis because I didn’t want her to hate my idea or find something obviously inherently fallible that I somehow missed. She gave me a hesitant green light and doubted that I could cover everything in 5-7 pages, but I reassured her that all my ideas naturally come to an end in 6 pages. My Literature & Medicine Midterm Paper centered around challenging/extending an argument of another author we read who claimed that pain is inexpressible. I tried to make the convincing claim that pain is indeed expressible when in a single-person context because groups of people actively prohibit pain’s expressibility. Yet pain is “inevitably inexpressible” (title of my paper) because humans are naturally drawn towards group settings. Overall, I tried to articulate my opinion that pain experiences an evolution of inexpressibility rather than beginning as an inexpressible concept. Although creating paper topics is deemed a not-so-enticing task, I dread the process of actually eloquently gluing the paper together with well thought out sentences. I vented about this at dinner tonight, saying how I don’t prioritize the importance of writing the paper over the importance of expressing ideas. I think it’s more important to logically explain your thought process rather than eloquently explaining; however, I tend to find the latter about 13 times more time consuming! It wasn’t a great experience (but it also wasn’t a horrible experience) staying up forever to write my midterm paper and practice for my math test, but at the end of the day, I’m just glad I had a place to do it! That may sound like a strange appreciation, but I remember not knowing where to go for a quiet place to study for the finals at the end of my freshman spring semester. It always seems like math/science people have the latest finals (since paper based classes have earlier deadlines). I usually always have a final on the last day of exams and at the end of my freshman year, one of my blockmates and I were stuck studying for the last of the last exam. We were studiously re-watching lectures in Lamont Library until around 1-2 am, we got kicked out because the library was closing even though it is notorious for being open 24 hours Sunday-Thursday. I just figured libraries would be open 24/7 during Reading Period and Exam Week and thought that would be a safe assumption. I ended up going to bed and waking up extra early to fit in more studying. Lamont Library will be open 24/7 during reading and exam periods this year. For more information, see the announcement in the Harvard Gazette. Our decision to make Lamont available for late night study during this time follows a successful trial run of 24-hour operations at the end of the spring semester. We want to thank everyone who made this possible, particularly the Harvard Library Access Services staff and the Undergraduate Council. Working together, we are pleased we could once again make this space available to you after normal business hours. Halloween! One of my favorite holidays! Not only are you able to stock up on a ton of candy, you have the chance to dress up and be anything you want to be for a day. I remember when my Brother and I were Power Rangers for Halloween- the Zeo kind, oh yeahhh. I was the Red Ranger, he was the Gold Ranger and we even got some of those $1 Spring Valley Swap Meet plastic ninja swords (do they still have those?) to go with it. We were pretty much invincible. Those were good times. 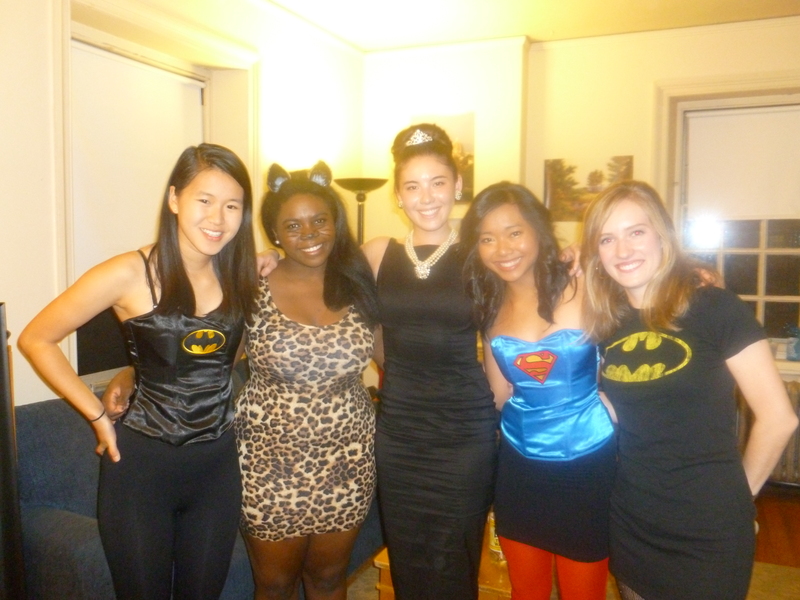 As I started to reminisce about all of these memories, I realized that this past Halloween was the first one I celebrated outside of the United States. And now that Halloween is over, it means that the Holiday Season is here… Yet, I am so far away from home that the “Holiday Season” doesn’t even exist in the country I’m in. I was speaking with my family recently and my Brother was telling me about the plans for Thanksgiving when I, all of a sudden, said, “Wait, can we do this too?” I don’t know how I forgot I was across the globe but I guess I got so into the conversation that I felt as if I was a part of the plans. My question surprised me but I didn’t think much of it. I’ve been away from home for so long that missing an event or celebration doesn’t hit me as hard as it used to. I’ve come to realize that one of the best parts about family is that you’re able to grow, separate from each other, and still come back to find the same love that was there when you left. Being away from home is always tough but don’t let it hold you back from enjoying where you currently are. If you’re going to be gone for so long, you should at least return with some cool stories to tell your family and friends right? So until I’m back in my Momma’s arms, be sure that I’ll continue to learn as much as I can about the beautiful city of Barcelona so I can come back and tell the family every last detail. I figured it’d be fun to do a visual-themed post, so I did a comic strip aaaaand here are some photos that I’ve taken around campus and Cambridge! I hope you enjoy them, and get a better sense of what your Freshman fall could look like here at Harvard. 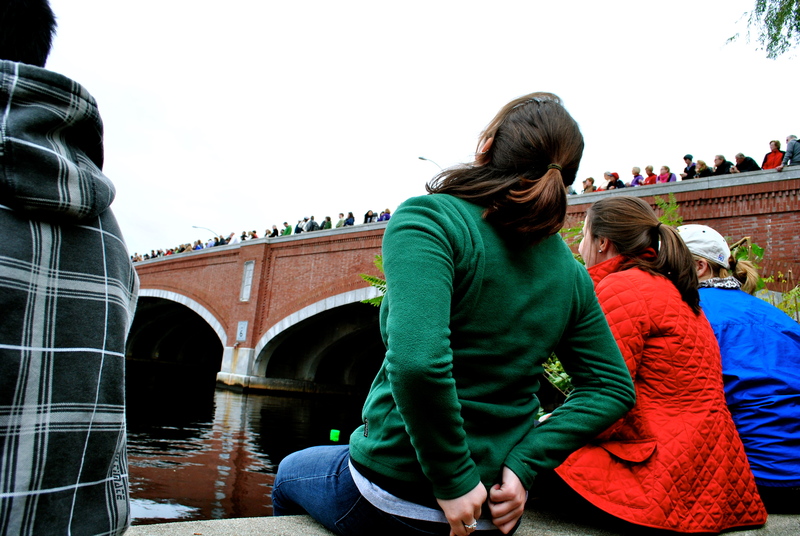 I know it's a little late, but the Head of the Charles was AWESOME! 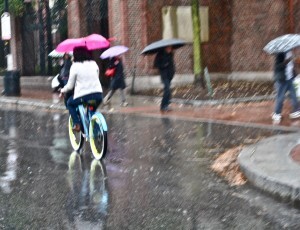 Someone was riding her bike with an umbrella…she's amazing. It snowed this weekend, which was incredible and beautiful and freezing (I am from Vermont, so there’s nothing better/more common than snow on Halloweekend). On Monday [real Halloween], my French class had a film screening in which we watched our own student-made francophone horror films, which were surprisingly awesome! Overall, this past weekend was a blast, full of horror, dancing, and candy. Mmmm, chocolate. You know when small periods of your life seem to have a theme? Like your life is just one giant theme party that no one told you about, and you’re looking around thinking, “Can this really be happening?” That was my weekend. 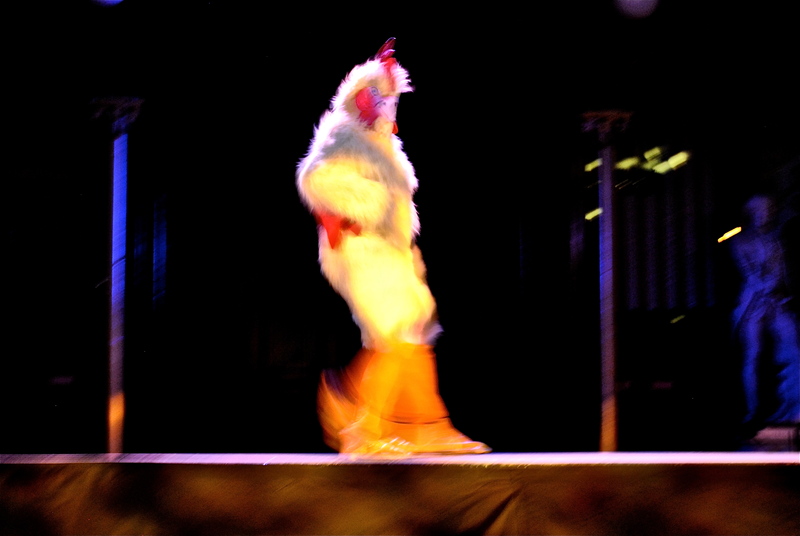 I mean, it was Halloweekend, so I was already all tee’ed up to see crazy people running around in cool costumes. That much I expected. What I didn’t expect was who those crazy people would be. But I’m getting ahead of myself. My sophomore year of high school I decided to take a break from my lifestyle in Sewickley, PA and go on a semester abroad in Zermatt, Switzerland with a program called Swiss Semester. On this program thirty other high school sophomores and I hiked, biked, mountain climbed, and skied our way around the Alps all the while having a break taking view of the Matterhorn. Literally all of my pictures from that trip look like they should be in a travel magazine, and I can assure you that it’s not due to my photography skills. This is where I made some really life-changing friendships. These other kids became my family, but because we all live in different parts of the United States, I have only been able to see them here and there, and often by chance. So, back to this weekend. On Thursday night, I said, “See ya!” to my roommates and headed down on the shuttle in the pouring rain/snow to Harvard Square. I was super stoked because I was picking up my friend Jenny from Swiss Semester who I hadn’t seen in four years, and who was in town for the weekend. Seeing her walk down the ramp from the T and into my arms was the most amazing experience in the world! Back in my room, we laughed and talked and shared stories about our lives, but what was the most amazing part was that even though we hadn’t done a particularly good job of keeping in touch and even though we hadn’t seen each other in forever, we were able to dive right back into where we had left off in the JFK airport four years ago. Friday morning I woke up bright and early (9:30 a.m.) to have breakfast with Jenny (Side note: I know that breakfast is the most valuable meal of the day… but you know, they also say that sleep is valuable, and sometimes breakfast just doesn’t happen for me. Ok, let’s be honest, breakfast NEVER happens for me, so getting up early on my first day of the weekend to eat with Jenny was a big deal. What can I say? I love my friends). Joining us was our other friend from Swiss Semester Renée who now goes to Harvard. So the whole thing was a giant Swiss-fest (or Swiss-fast, you know cause it was breakfast… ha… ha… no? I need to stop it with these terrible puns). After again being struck by how easily we fell back into our friendship and talking and laughing some more, I bid them both adieus. I had to go get dressed so that my Swiss Semester friend- themed day could continue. After dropping off a paper that was due at noon for my Literature and Sexuality class, I took the T to MIT, and got on a bus to Wellesley College. I know I’ve mentioned this before, but my best friend in the world Heather goes to Wellesley. What I might not have mentioned is that I also met her at Swiss Semester. Because she and I both go to school in the Boston area, we get to see each other a lot more than we did in post-Swiss Semester high school where she lived in Minneapolis and I lived in Pittsburgh. After we spent the beautiful New England day hanging out by the lake, she returned with me to Harvard for a Harvard Model Congress Halloween Party! Saturday I woke up super early (7:45 am) to go to an all day Harvard University Women in Business conference at the Westin Hotel downtown for most of the day. I will have to devote an entirely different blog post to Women in Business sometime because it is SO COOL! But I’m getting distracted. After the conference (during which it had started to freezing rain), I came back to Harvard to layer up – I was going to the Harvard vs. Dartmouth football game, where my friend Todd (who is ALSO from Swiss Semester) was coming down with his frat TDX to mix with my sorority Theta! Suffice to say, this weekend was all about seeing old friends. While my old friends in this case may have all coincidentally been from a super awesome program I did in high school, I have found by and large that while making new friends is part of what college is all about, staying close with your old friends isn’t so hard either. Yes, you may not keep in contact as regularly, as long as your friendships are long-lasting they will be… well, long in their lasting, and will last through all sorts of separation. So don’t worry too much about going off to school and losing touch. If you want the friendship to still be there when you return home, it will be. My Halloween weekend was filled with dance, music, and costumes. I attended the Expressions (a hip-hop dance organization on campus) show and an a capella concert put on by The Veritones and The Callbacks. Friends of mine are members of all three groups, so I love supporting them and I look forward to their shows every semester. If you’re ever around Cambridge when there’s a performance, you should definitely check it out. Otherwise, search for them on YouTube because each group puts on an awesome show. You won’t regret it! My preparation for Halloween was a bit of an arts and crafts project. I live in a suite with four other roommates, and while one of them was traveling to Princeton with the Lightweight Crew team for a race, the rest of us had planned on a “Where’s Waldo?” theme. Unfortunately, two of the guys were feeling under the weather so Adam and I were the only ones who got dressed up. I thought our idea was super original, until we walked around campus only to find multiple Waldos wherever we went! No offense to all the other Waldos, but I thought my striped shirt was the best. 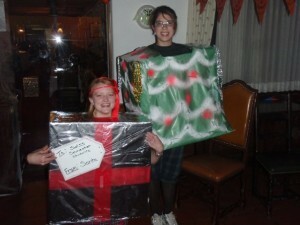 Here’s where the arts and crafts come in: I made it myself using red duct tape! Can you tell? I can’t take all the credit because I got the idea from a video I saw online, but I thought it was cool regardless. 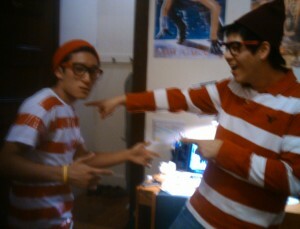 My roommate Adam and I as "Where's Waldo?" Tonight, Quincy House (the dorm building I live in) is having a pumpkin carving event in the dining hall! While I’ve never been very good at carving pumpkins, I know there’ll be some pros out there. If I’m not too embarrassed about the finished product, I’ll post a picture of my pumpkin…but no guarantees!